If you have followed my blog through the years, then you already know that one of my very favorite authors (and very favorite individuals) is Adriana Trigiani. I met her a few years ago at BEA and we continue to "keep in touch." I absolutely adore her and there isn't a thing she can write, say or do that I don't love. She has written numerous bestsellers including the Big Stone Gap Series, the Valentine series, and the epic novel THE SHOEMAKER'S WIFE. And now she has written and directed her first feature film -- Big Stone Gap -- which hits theaters this Friday. Only two more days! Needless to say, I'll be at the first showing at 12:10 p.m. -- I can't wait! Adriana had been talking about making BIG STONE GAP into a movie for years. I always thought this book would convert well to a film, but I had no idea how "big" it be. (Knowing Adriana, I never should have questioned her abilities!) As the pieces came together, I was blown away by the cast she assembled -- Ashley Judd, Patrick Wilson, Whoopi Goldberg, John Benjamin Hickey, Jane Krakowski, Anthony LaPaglia, Jenna Elfman, and more. Wow -- just wow! Can you tell that I'm super excited about this movie? I have read BIG STONE GAP a few times over the years, and I have loved it every single time. The characters are terrific and I love the heartwarming story. Since it's been a few years since I've read BIG STONE GAP, I decided to do a little re-read in preparation for the movie's release. (Plus, I just had to get a copy with the gorgeous movie-tie in cover.) It probably won't surprise you that I loved it all over again... and it was especially fun to picture the actors and actresses as the characters. 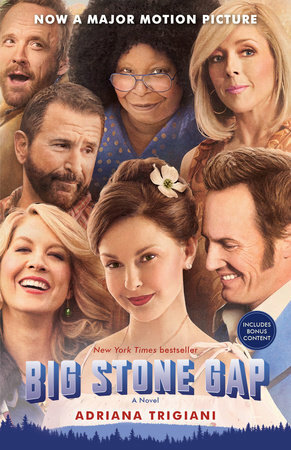 BIG STONE GAP tells the story of Ava Maria Mulligan, a 35 year old woman who lives in the small town of Big Stone Gap and runs the local pharmacy. She has been single her entire life and pretty much accepted that she's the town spinster, but she still takes comfort in knowing that she has special friendships in her life. After her mother dies from a battle with cancer, Ava Maria finds herself a bit out of sorts... especially after learning that her mother had been keeping a pretty big secret from her. Given the new information, Ava Maria sets out to learn about her past; and in doing so, learns more about herself than she could ever imagine. She meets new family, makes new friends, and even finds herself drawn to a man... or two. Ava Maria does some major soul-searching in this story and discovers quite a few life lessons -- namely "When one door closes, another opens." BIG STONE GAP is just a wonderful story! It is a funny, yet moving, story about a woman rediscovering herself; and in so many ways, it's a coming-of-age story (albeit for a thirty-something woman.) I absolutely love Ava Maria and her life in Big Stone Gap, and this novel is one that makes me both laugh and cry. It celebrates love, loss, friendship, and faith -- it's just a beautiful story in so many ways. One of the reasons that I enjoyed BIG STONE GAP so darn much were the characters. Ava Maria is one of my all-time favorite characters but her quirky cast of friends made the book extra-special. Readers will recognize their own family and friends in some of the unique traits that these individuals display, and I guarantee their actions will generate quite a few laughs! I also love the messages in this novel. I think I take away something different each time I read it. I remember thinking the book was funny and sweet the first time I read it. Then, I recall examining Ava Maria's life and how much she changed when we discussed it for book club. This last time, I took away some valuable messages about faith. For some reason, that theme really resonated with me this week. I guess what I'm saying is that this novel has meant something different to me each time I pick it up -- and that's always a sign of a special book in my mind! The movie tie-in edition of BIG STONE GAP has a few fun extras. Besides the beautiful cover, it includes behind-the-scenes bonus material from the film—including photos, excerpts from the script, and a sweet note from Adriana. In addition, I liked that there recipes from the various foods mentioned in the book like Hope Meade's Wedding Mints and Cousin Dee's Peanut Butter Balls. My book club actually read BIG STONE GAP back in 2004. It really is a terrific book club selection. And now with the movie coming out, you could read the book, see the movie and then discuss them! There is a reading guide available with fourteen discussion questions. Some of the themes you might want to explore include family, loss, grief, friendships, second chances, choices, trust, forgiveness, acceptance, and faith. Not that I'm biased or anything, but I highly recommend both reading and viewing BIG STONE GAP! I just reread this book too and loved it even more the second time around. I can't wait to see the movie on Friday! Sounds like I definitely need to see the movie - even if I don't get around to reading the book first. I should really reread this in the next week, but I probably won't. Regardless, looking forward to the movie.